The 2018 Ford Mustang is Almost Here…Are You Ready? If you’re in need of something to look forward to, we have your answer. The 2018 Ford Mustang is very highly anticipated and for good reason: this will be its first major overhaul since 2015. While it doesn’t seem like a whole lot of time between now and then, a new look and more refined features always make for an exciting model release. Upon its release later this year, we know you’ll be itching to get behind the wheel. It’s all about the feeling. From the outside in, the all-new Mustang will continue to impress. LED lighting is now standard across all packages, giving the front fascia a much more aggressive and attractive look. The available fog lights are also LEDs, so no matter where you’re going or what you’re doing, you won’t go unnoticed. Additionally, every trim level comes with MagneRide dampers (meaning they’re magnetically controlled), new shock absorbers, a new cross-axis joint in the rear suspension, and improved stabilizer bars for overall improved handling. On the 2018 model, you’ll also find new paint colors – with orange being its signature color – four spoilers to choose from, new stripe choices, and more wheel options. Customization is the name of the game with this new Mustang so whatever you build will be perfect for you. Go inside the Mustang and you’ll find everything you could ever need to make your driving experience perfect every single time. 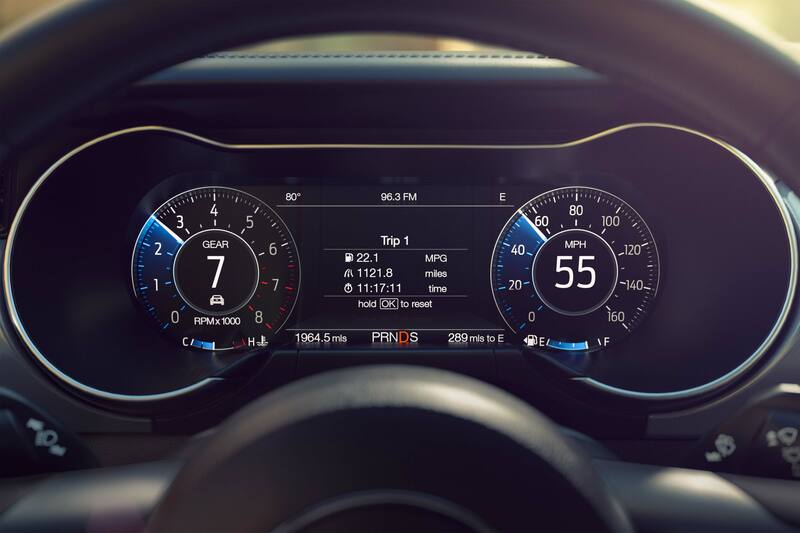 The available 12” (yes, 12) LCD instrument cluster is the first-ever all-digital display offered on the Mustang. Even more exciting, you can fully customize the entire display – from colors to gauge layout – so you’ll always see everything you want to and all that you need to. Make sure you keep your eyes on the road though; it can be kind of hard to look away from all of those shiny lights 😉 In case didn’t think it could get much better, opt for the heated steering wheel. Enough said. The Mustang is fast. It’s always been fast. 2018 is more of that. With two engine choices, you can choose your fast. The 2.3L EcoBoost has more torque than its predecessors. The 5.0L V8 Coyote has more power and efficiency…and also more torque. Whichever one you choose, it will be the right decision. The all-new available 10-speed automatic transmission will stop you in your tracks. It has the Ford-patented power-flow and direct-acting hydraulic controls, which are both designed for optimum ratio progression and efficiency. All-new Active Valve Performance Exhaust allows you to choose when you want those around you to hear your Mustang’s rumble or when you feel like keeping it at a lower notch. We’ve said it before and we’ll say it again: customization is the name of the game with this Mustang. Keep your eyes out for this highly sought after 2018 Ford Mustang – it should be arriving later this year. 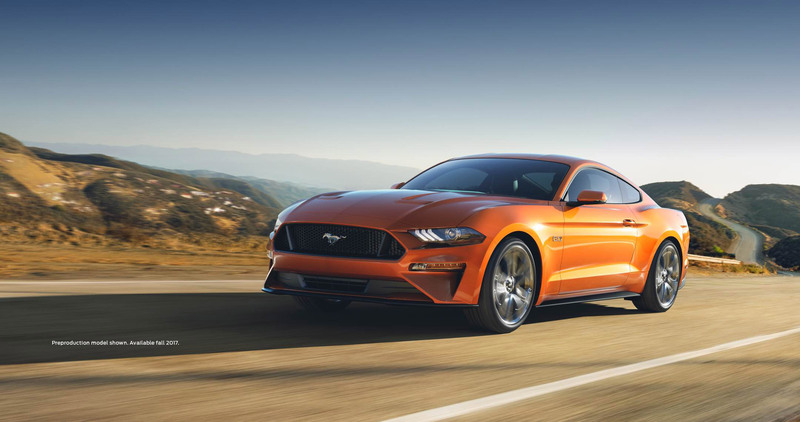 All of us at Lester Glenn Ford in Monmouth County are here for your Mustang needs so don’t hesitate to reach out to us or visit us at 900 NJ-35, Ocean Township, NJ 07712. We’ll be waiting for ya! The 2018 Subaru Crosstrek is Turning Heads…And We Know Why!